Hit By Flooding And Pumping System Crisis, New Orleans Braces For More Rain : The Two-Way Despite public assurances that pumps were operational, the city saw severe flooding last weekend. Now there are concerns more flooding might be on the way. 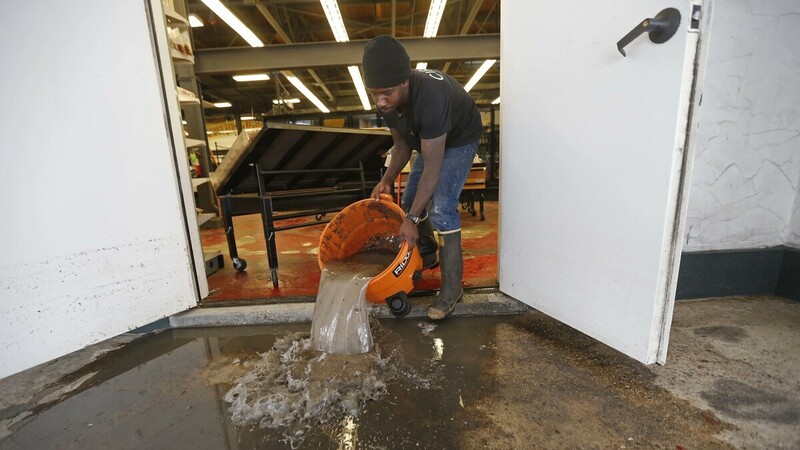 Dwayne Boudreaux Jr., owner of the Circle Food Store in New Orleans, dumps out dirty water that was vacuumed up from the store on Monday, after severe flooding over the weekend. The city's pumps were not fully functional, officials now acknowledge. Boudreaux told a local news station that the last time he saw waters rise so high was during Hurricane Katrina. On Saturday, heavy rains fell on New Orleans, causing floodwaters to rise in low-lying areas — and linger for hours. At first, officials said the city's pumps and drainage system were working fine and that the storm was just unusually strong. But that wasn't true. Many of the pumps were out of service or operating at partial strength. The problem has yet to be fixed. In fact, it has gotten worse: A fire has left the city with just one generator, out of five, to power its pumps. And with even more rain in the forecast, the city is bracing for the possibility of more flooding. Mayor Mitch Landrieu is encouraging residents to move their vehicles to higher ground, and Lousiana Gov. John Bel Edwards says he has declared a state of emergency out of "an abundance of caution." Concerns over New Orleans' drainage system have been growing since the first signs of a problem on Saturday. The storm that started it all was "torrential," The Advocate reported. Water rose waist-deep on some streets on Saturday afternoon. "Even some streets in the French Quarter — an area that usually remains relatively untouched by floodwaters — saw flooding, including sections of Bourbon Street," the newspaper wrote. "Windell Bean's family has owned their home on St. Ann for 53 years. Other than Katrina, the house hasn't flooded since 1978. That is until Saturday, when it took on 4 inches of water.
" 'I stood up on my porch,' says Bean, 'and the drains were taking water in, and then all of a sudden it just stopped and then the water started coming up.' "
The stormwater "sat stagnant for hours, into the night and early Sunday morning," the Times-Picayune reports. In some places it was standing for 12 hours. Parts of New Orleans are under sea level; a pump and drainage system is essential to prevent floods. While city officials initially said the pumps were working fine, they acknowledged on Tuesday that it wasn't true. In fact, Cedric Grant, the director of the Sewerage & Water Board, acknowledged there were "power generation issues" and that more than a dozen pumps were out of service. Some drainage stations were functioning at less than 60 percent of capacity, Jessica Rosgaard of WWNO reported for NPR this week. "The incident caused a shakeup at the department," Rosgaard said. "Grant has submitted his resignation — and Mayor Mitch Landrieu has said others should be fired, citing a lack of public confidence and a need for restructuring." Since then, the situation has worsened. The pumps that drain water out of the city's low-lying neighborhoods are powered by generators, WWNO's Travis Lux told NPR on Thursday. "Three of the five generators were already out of service, [which] contributed to several feet of flooding over the weekend," he said. "Last night, a fourth caught fire — leaving just one left that works," Lux reported. "Schools have been canceled, and Mayor Mitch Landrieu is urging residents to move their cars to higher ground." The city is trying to find backup generators, he says, and "many worried residents say it's all bringing back bad memories of Hurricane Katrina." The Associated Press notes that "having the system besieged and broken down in August could not come at a worse time for New Orleans, since the Gulf Coast is in the middle of hurricane season. Thunderstorms are also prevalent in New Orleans during August." The National Weather Service forecast for New Orleans: Showers and thunderstorms likely on Thursday, Friday, Saturday and Sunday.